I have a slight cold and needed a warm Herbal tisane this afternoon. Fortunately this last week I accidentally uncovered TranquiliTea‘s “Sarsaparilla Summer Herbal”, lost for at least a year in a box at my parent’s place. It works out well since I haven’t been out to Plymouth in quite some time and TranquiliTea was overdue for a review. Herbal tisanes don’t die that easily so I thought I’d brew some up and hope for restorative root beer powers. Frustratingly, as with most things from TranquiliTea, I have no idea what’s in it or where it comes from (though I have my suspicions that it’s from TeaSource). Interestingly, the best and worst thing about Sarsaparilla Summer Herbal is its scent: a field of heather and coriander supports a robust root beer that will make you sneeze painfully. In texture, Sarsaparilla Summer Herbal is exactly what you’re expect–rough and tumble fennel and licorice with a smooth syrupy finish. 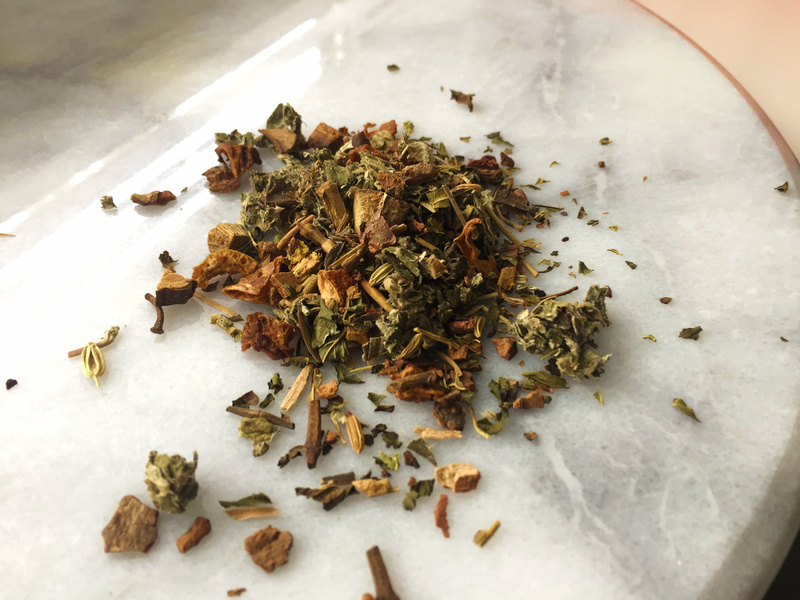 Flavor-wise Sarsaparilla Summer Herbal is equal parts sweet root beer and bitter chai. Its liquor is an orange-tinged pale ale. And, I was right: Sarsparilla Summer Herbal is identical to TeaSource’s Sweet Sarsparilla. Gotcha! Sweet Sarsparilla is made up of the following: cinnamon, licorice root, orange peel, papaya leaf, peppermint, raspberry leaf, wild cherry bark, chicory, cloves, sarsaparilla, fennel extract. I don’t know where the other components are from but, Sweet Sarsparilla is a plant native to Eastern Australia. It’s probably one of my favorite Herbal tisanes (though that’s obviously not saying much). Sarsaparilla Summer Herbal (TranquiliTea) ~ loose leaf by Jocilyn Mors is licensed under a Creative Commons Attribution-NonCommercial-ShareAlike 4.0 International License. Sarsaparilla Summer Herbal (TranquiliTea) ~ loose leaf macro 14x by Jocilyn Mors is licensed under a Creative Commons Attribution-NonCommercial-ShareAlike 4.0 International License. Sarsaparilla Summer Herbal (TranquiliTea) ~ spent by Jocilyn Mors is licensed under a Creative Commons Attribution-NonCommercial-ShareAlike 4.0 International License. Sarsaparilla Summer Herbal (TranquiliTea) ~ liquor by Jocilyn Mors is licensed under a Creative Commons Attribution-NonCommercial-ShareAlike 4.0 International License.